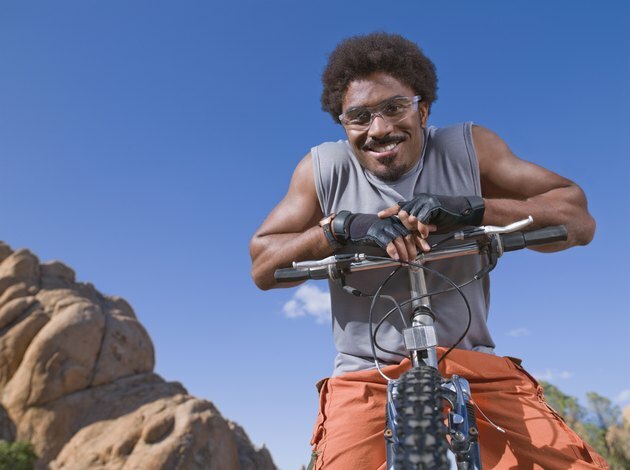 Cycling is a low-impact exercise, and those who actively participate in cycling have about 10 percent more leg muscle than those who refrain from exercise, according to the Chester Knee Clinic & Cartilage Repair Centre. Cycling outdoors provides the most challenging workout, but indoor cycling can also lead to stronger leg muscles and knees. All of the leg muscles, as well as the muscles in the hips and the buttocks, are worked during cycling. The leg muscles that get stronger include: adductor muscles; soleus and gastrocnemius muscles of the calves; rectus femoris and vastus medialis, lateralis and intermedius of the quadriceps; and semitendinosus, biceps femoris and semimembranosus of the hamstrings. Have your bike seat properly fitted to get the optimal use out of your muscles. If the seat is too high you risk overstretching your muscles; too low and you will not use your muscles to their full potential. Properly warm up by riding for a few minutes at an easy pace, then stretch each major muscle group of your legs. This will allow your muscles to easily transition from rest to activity and help to prevent injury.